Typical pop-up campers are great for saving space, but not so great for easy setup. 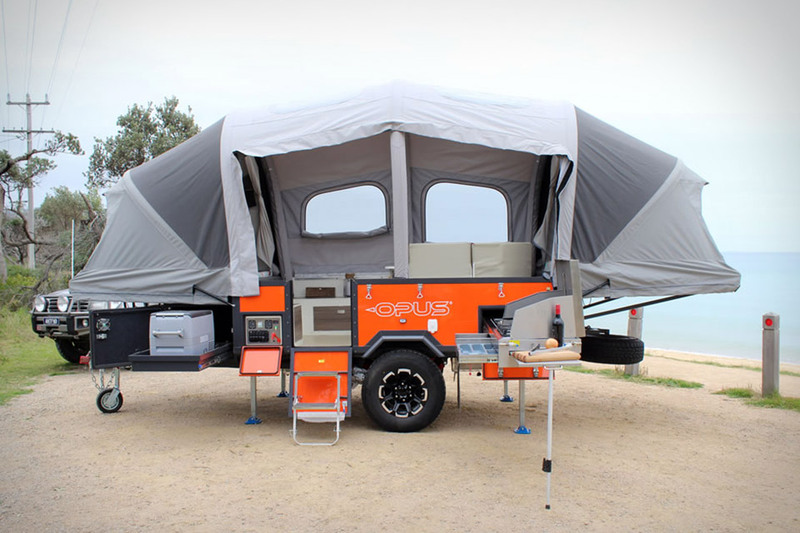 The Air Opus Pop-Up Camper alleviates this by replacing traditional poles and cranks with air-filled supports that inflate in just 90 seconds with the flip of a switch. The option is available on both standard and off-road Opus models, which also feature dual double beds, kitchenettes, living area skylights, and electric brakes. The Timbersled Snow Bike System turns yours dirt bike into an agile snowmobile. One of their systems will fit almost any bike and includes a front ski and a rear track that replaces your tires. Each system is universal and requires a motorcycle specific install kit and can be installed in less than three hours. Timbersled has four options for 2018, including the brand new Aro models that are quicker and lighter with a new chassis to help get the bike on top of snow faster. Florida-based Cigarette Racing's partnership with Mercedez-Benz continues with the 515 Project One Speedboat. Inspired by the Mercedes-AMG Project One Supercar, this 51-foot vessel is made from carbon-fiber, Kevlar and E-glass, accommodating six passengers while maintaining a top speed of 140 mph. Dual Mercury Racing Quad Cam 4 Valve engines and M8 stern drives deliver up to 3,100 hp, with electronic key fobs controlling the power, based on your purpose — pleasure or racing — and what type of fuel is being used. Finnish boat design meets German engineering in the Brabus Shadow 800 Boat. Based on the 37 Sun Top from Helsinki-based Axopar, this 11.2-meter cruiser is more than a cosmetic upgrade. It's powered by twin 400 hp Mercury Verado 400R outboards, giving it a maximum speed of over 50 knots, while carbon fiber accents and fine leather and Alcantara in the cabin give it the same feel as Brabus' performance cars. Limited to 20 hand-made examples. Give your dirt bike a wintertime overhaul with the Camso DTS 129 Snow Bike Conversion Kit. Included in the package is a four-keel front ski with a replaceable angle blade that helps with side-to-side movement, as well as a 12.5-inch wide rear track assembly made especially for bikes. 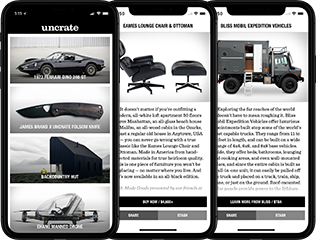 A single rail suspension ensures the bike still rides like a bike, and the wraparound cage helps protect critical components while doubling as a cargo rack. Most large yachts have space for a tender and toys. The Dare to Dream Superyacht concept is the same — except its tender is a 100m airship. Drawing inspiration from both traditional yacht and military vessel design, the 140m ship's angular form offers space for 12 guests and 40 crew, as well as a helipad, jacuzzi, dining room, and lounge. The airship — named the Flying Diamond — offers additional accommodations for a couple of guests, as well as a saloon space for hosting dinners or cocktails mid-air. The RZR family has, until now, been known for its ability to let one or more passengers enjoy your adventures. In the Polaris RZR RS1 Off-Road Vehicle, it's all about you. Its single-seat, center-of-mass driving position offers unparalleled visibility, balance, and feel. The width remains 64 inches, while a 110 hp ProStar 1000 engine provides plenty of power and the RZR XP 1000 suspension, drivetrain, and 83-inch wheelbase let it tackle any terrain. Available in white or black.